© 2003 Artist Rights Society (ARS), New York, New York/ADAGP, Paris, France. Emile Lenoble studied at the École des Arts Décoratifs in Paris before working for his father-in-law, the famed late nineteenth-century French ceramist, Ernest Chaplet. Through experimentation, Chaplet’s guidance, and exposure to Pre-Columbian, Asian and Greek ceramics at various exhibitions, Lenoble developed a personalized vocabulary of expression. Traditional shapes decorated with precise geometric incisions characterize his work and reflect the influence of ancient cultures on his vessels. Lenoble often complemented his stylized and abstracted patterns with white, beige and black glazes, reinforcing his ties to ceramists of antiquity while also appealing to graphic Art Deco sensibilities. Notable Art Deco designers such as Jacques-Emile Ruhlmann recognized Lenoble’s talent and often commissioned pottery from him. 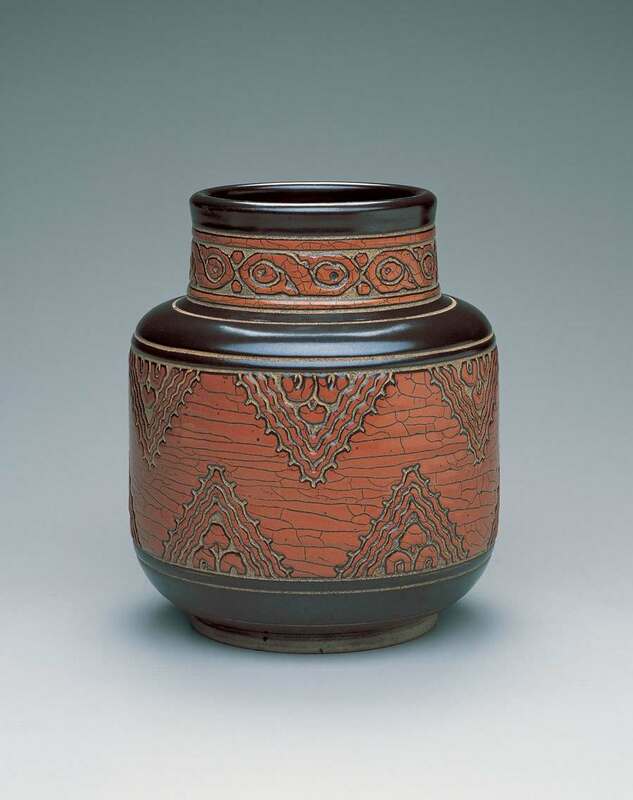 George Booth purchased this vase from the “International Ceramic Exhibition” organized by the American Federation of the Arts. This traveling exhibition came to the Detroit Society of Arts and Crafts in 1929. Booth, a founding member and past-president of the Society, purchased several works from the exhibition in order to represent the finest achievements in contemporary art at his newly formed educational community, Cranbrook.